Great Britain's Deputy Prime Minister Nick Clegg, visited last week one of Prysmian Group manufacturing plant and met the employees. 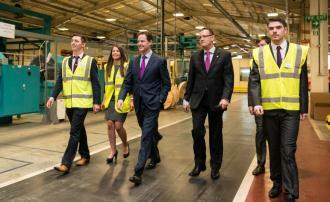 He focused particularly in how the skills shortage is threatening the future of UK manufacturing. In the UK the company operates nine manufacturing units in four sites with some 1400 employees. It is committed to its manufacturing operation and over the last four years has invested some £58million in this region. This investment has seen the development of the High Voltage Testing laboratory at Bishopstoke (opened in 2013), alongside the improvement of plant and equipment throughout the operation. In 2013 the company also acquired the Global Marine Energy (submarine cable installation) company. CEO Paul Atkinson summarised the issue: "We have been manufacturing in the UK for 100 years and have always understood the need to train the next generation of skilled staff. We are committed to the apprentice programme and always recruit students for their industrial placement year. However, we sincerely believe that for at least the last decade there has been too much emphasis on purely academic education while the engineering and industrial skills on which our manufacturing sector relies have been treated as a second-class career path." The company's response to this challenge is to increase its investment in in-house training, and, just as significantly, to foster relationships with local schools in order to present the option of vocational qualifications as the gateway to a rewarding career. Training and staff development are part of Prysmian Group's fundamental values and the UK participates in global training initiatives that support the integration of the different national business units. In 2012 two candidates from the UK were selected into the Prysmian Group "Build the Future!" Graduate Program and are currently on international assignment. The program selects high-potential candidates with the objective of helping to build the Group's management and professional team of the future. Nick Clegg said: "In the South East alone, 253,000 people started apprenticeships in the past four years. That's a 90 per cent increase in the number of people starting apprenticeships in the South East under this Government. The message from business is clear – we need a workforce that is trained and skilled for the local jobs market. Fortunately the days when a vocational education was seen as the poor relation are over. More and more young people are choosing apprenticeships and businesses say they simply couldn't function without the talent and ambition apprentices bring. I'm delighted to be able to meet with young people starting their careers working for Prysmian – its good quality apprenticeships like these that give hard-working young people the chance to aim high for their dream job whilst playing their part in building a stronger economy for Britain." "Government can do much to support vocational qualifications and we are keen advocates of the modern apprenticeship programme" continued Mr Atkinson. "To safeguard the future of manufacturing in the UK, manufacturers need to work in partnership with government agencies and the education system to change attitudes." In its centenary year, Prysmian has 14 apprentices employed across its four UK manufacturing sites, together with 24 students on industrial placement. This represents a significant investment for the company which believes that it is the only way to safeguard the future of its UK manufacturing operation. Many of the company's senior engineering staff were originally recruited through the apprenticeship scheme and Prysmian is happy to sponsor talented individuals through further training as appropriate throughout their career. Prysmian itself is an important partner in the development of a low-carbon energy generation industry in the UK, developing power connections for major offshore wind farms including Walney, Ormonde, Gunfleet Sands, Thanet and Great Gabbard. In 2012 the company was awarded the contract for the Western Link submarine connection between Scotland and England, a strategically important project for the country which will provide extra capacity in the entire UK electricity transmission system and on course for completion in 2016. In January 2013 Prysmian Group received the Investor of the Year Award from the British Government and UK Trade and Investment in recognition of its long-term commitment to British-based manufacturing.